The Train Air Horn Kit by Kleinn will keep your Jeep Wrangler JL clearly heard. Boasting an exceptionally loud 154.2 dB at 150 PSI. Not only can these horns produce a shattering horn sound they can even be felt. 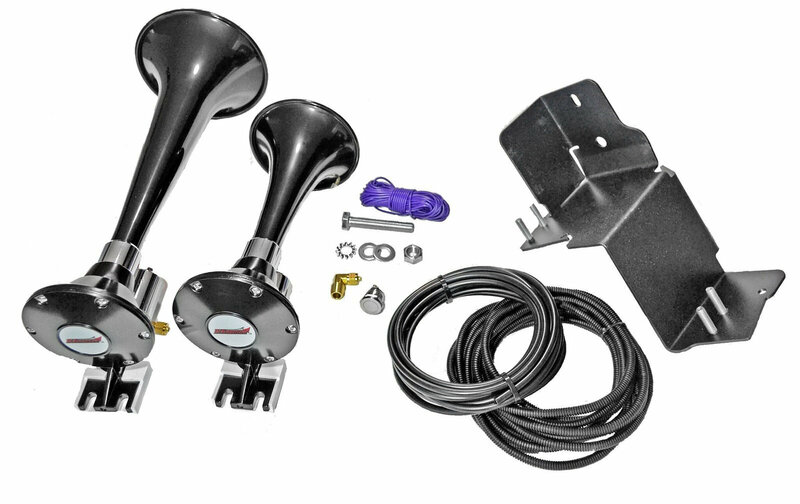 Kit includes a model 220 Dual Train Horn and custom brackets for your JL. This Air horn requires a high volume air compressor (Min 100 PSI) and a 1 gallon tank (minimum size) which is sold separate. Extremely Loud Horn: Be heard and felt from all around with this 154.2 Decibel intense horn blast. Direct Fitment: A simple bolt on installation mounting to the passenger side frame rail, next to the transmission. Includes all the JL mounting brackets and hardware. Fitting both the 2 door and 4 door applications. Air Pump & Tank Required: Either purchase the Klein part # JL-JK-OBA which is an On-Board-Air system for your Jeep Wrangler to run these train air horns or any other compatible brand. Air Compressor with minimal 100 PSI and minimal 1 gallon tank required. Where does this mount to? It looks like a specific location on the Jeep. Passenger side frame rail, next to the transmission. Please see installation instructions for detailed diagram.